Diane Borradaile recently joined Capital Impact as its new Chief Lending Officer. She leads her team to support Capital Impact’s mission to empower communities to break barriers to success by facilitating loan transactions for health care centers, charter schools, affordable housing, healthy food projects, and more. Diane’s commitment to community development has spanned more than 35 years, through lending at both commercial banks and Community Development Financial Institutions. In this blog, we take some time to get to know more about Diane, her history, and what keeps her committed to building communities of opportunity. 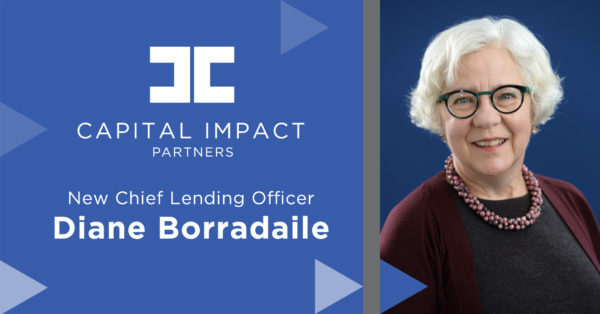 Diane Borradaile ​joins Capital Impact as its new Chief Lending Officer. Q: What is your professional background? How did you get into lending? 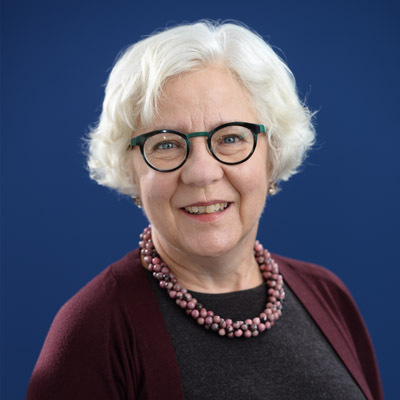 Diane: After receiving a master of public administration degree, my very first job was working for New York City’s Department of Housing Preservation and Development. I discovered that housing – beginning to end, the financing part, the physical part, all of that – really turned me on, and the mission orientation of a housing agency was what I had sought. I recognized that this meant something to me in a very, very deep way. Q: You have experience both in commercial banks and CDFIs. How would you compare the work in the commercial sector with the work of Community Development Financial Institutions (CDFI)? Diane: Every bank I worked in was all about affordable housing, and it was primarily lending to build new and preserve existing affordable housing. The banks did not engage in much lending to acquire buildings or finance pre-development costs, such as legal fees, facility design plans, and environmental assessments. There is less risk tolerance in a commercial bank, [which] probably sets up barriers to financing sooner than it would in a CDFI transaction. In order to make loans, banks require that there must be a certain amount of value to the property (facility) or transaction for which they are providing a loan, and that value is often higher than CDFIs require. Additionally, commercial banks fund themselves for short periods of time, so they have no interest in doing long-term lending because it would complicate how they cover their costs. So, banks would not engage in any permanent loans or many term loans, which are funded for a predetermined number of years. My first experience working for a CDFI was at Low Income Investment Fund (LIIF), and it was very different [from a commercial bank]. We still provided lending for facilities, but also for all kinds of services to low-income communities, not just affordable housing. We provided real estate lending for charter schools and Federally Qualified Health Centers (FQHCs), things like that, but you had to understand the business of the charter school, and the business of the FQHC, in addition to the real estate transaction. That’s very different from what happens in a commercial bank. Q: What precipitated your transition from commercial banking into the CDFI sector? Diane: Well, I got laid off in November of 2007 during the Great Recession. And one year later, almost to the exact day, my husband got laid off from his financial services job. I was doing consulting in that in-between period. One of my clients at the time was LIIF, and just a chance comment – “One of us needs to get a job” – and the rest is history. LIIF at the time had newly created a position called Senior Asset Manager, someone to come in and handle all of the loan workouts. So, that is where I ended up. Q: What experience and experiences did you gain from commercial banking that you feel have helped you in your work at a CDFI? Diane: Strictly from a lending perspective, many of the concepts and fundamentals are the same. How you choose what you are going to lend on is different, and the risk tolerances are higher than in banks. You are also more hands-on with the borrower. There is not this distance to maintain, the need to say, “No, I cannot help you. You are supposed to already know how to do this.” There is just a lot more willingness at a CDFI to assist a borrower to get to something that is financeable. You do not do that in banks. But to provide effective guidance, the lender has to know how to get there, and that is what a bank taught me. Q: What changes are you seeing within the CDFI landscape? And how do you feel like those changes are going to impact future community investment? Diane: I think there is still some fallout from the recession and afterwards. In addition, as more and more people understand what CDFIs do, there is more specialization, [so] that if you are talking to Capital Impact about something, it is very different than talking to a CDFI that does homeownership counseling or something like that. It is really the professionalization of CDFIs, I think. As an example, the largest four CDFIs have had to develop structures that produce mission results, but also produce financial results; that is professionalization because you have to understand how those pieces all come together in a sustainable way. Q: What motivates you to continue empowering disenfranchised communities? Diane: Morally, it is the right thing to do, and that is how I want to live my life. It is just intrinsic to my very soul. It is not a particular religious leaning; it does not come out of a personal hardship or anything like that. It is just that this is the right thing to do. Diane: Michigan. A suburb of Flint. But I have lived in the New York metropolitan area much longer than I lived there, and I think I found the right personality match when I moved to New York. Q: You are joining other Capital Impact staff living in the New York metro area. What is your favorite part of living in the New York area? Diane: The energy. And snarkiness. Turning a witty phrase or being cynical in a witty way is kind of a New York thing, right? I personally embrace that. And frankly, being direct, another New York attribute. Q: What do you consider your greatest either personal or professional triumph in life? Diane: Both of my sons made it through adolescence, and they are still alive. Q: Do you feel, when you look back on your career, like you’ve made worthwhile changes for people? Diane: I think I have. Although – and this is something that I’ve been thinking about recently, and it is part of the dialogue here, at Capital Impact – I was in New York long enough ago to see that the gentrification in many NYC neighborhoods today is an outcome of subsidy programs in those same neighborhoods that at the time suffered from disinvestment and abandonment. And so, how do we escape a process that, by investing dollars that were intended at the time to benefit those who lived in the neighborhoods – who had limited services, and this was all a very positive thing to bring these resources – those investments then attract people and market-driven dollars that displace those same residents? What do we need to understand and structure to keep from just repeating this cycle? Learn more about Capital Impact’s strategic financing and how our lending and programs impact disinvested communities nationwide. Also, President and CEO Ellis Carr discusses how CDFIs expand opportunity in underserved communities in this More Than Money podcast.